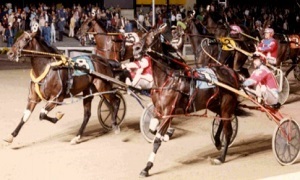 Bret Hanover was an American harness racing horse, specidically a pacer. The son of the great sire, Adios, by the mare Brenna Hanover, Bret Hanover was born in 1962. 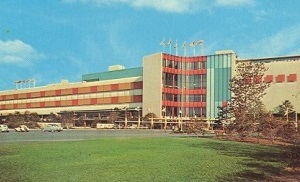 He would become one of only nine horses in history to win harness racing's honor by capturing the Triple Crown of Harness Racing for Pacers. 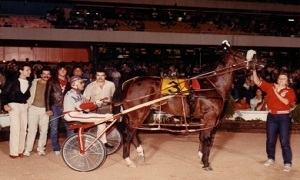 Driven by Frank Ervin, in his 1964 debut season in racing, two-year-old Bret Hanover was undefeated, winning all 24 races he entered and would continue undeafeated for 35 races. In his second season of racing, he was 21-for-24 and in his last year of racing at age four, he was 17-for-20 for a career total of 62 wins in 68 races. 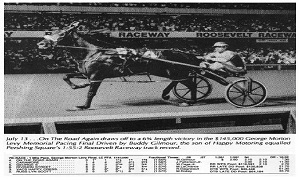 He was voted Horse of the Year for all three years by the US Trotting Association and the US Harness Writers Association, the only pacer ever to accomplish that. Bret Hanover was retired to stud at Castleton Farm in Lexington, Kentucky where he immediately became one of the most in-demand breeding stallions in harness racing. Among his many successful offspring were Little Brown Jug winners Melvin's Woe and Strike Out.